Any outdoor sport has inherent risks. However, paddling is as safe as you make it. Before taking to the water get proper information and training about canoeing. You can do this by attending or joining your local canoe club or by doing a course at a CANI approved centre (www.cani.org.uk). You will learn how to deal with emergencies and how to capsize safely as well as basic boat handling skills. You don’t need to be able to swim vast distances but you will need the water confidence to make sure you can deal with a capsized boat and get ashore safely. Has long been the rule about group sizes when paddling. It’s essential to always have a few others along in case of an emergency. These awards are aimed at providing paddlers with the necessary safety and awareness to ensure the safety of themselves and others. Secondly, they aim to provide paddlers with the rescue skills to help themselves or others in difficulty. These courses provide you with the basic knowledge and skills you need to give first aid should the need arise. The courses are tailored to the demands of paddlers. These are aimed at encouraging safe white water paddling, covering leadership and river running skills that can be applied to most white water situations, so that you can avoid difficulty through good paddling skills. Secondly, the courses cover a range of ways to perform rescues when the need arises. 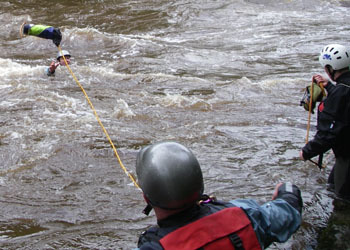 The White Water Safety and Rescue course is entirely designed around relevant skills for the river – instead of complicated rope extraction techniques, it concentrates on what usually goes wrong on a river and how to sort it out. Cover cuts and scratches with a waterproof dressing as soon as possible. Avoid capsizing in still or slow-flowing water and try not to swallow river water. Always wear shoes or other footwear on the water. If you’ve been paddling, wash your hands before eating, drinking or smoking. Where possible, shower after paddling. Leptospirosis is an animal infection. After recovery the animal excretes the organisms in the urine. The bacteria survive for days or even weeks in moist conditions, but only for a few hours in salt water. The infection is caught by direct contact with the urine or polluted environment. Bacteria enter through skin abrasions or via eyes, nose or mouth. The usual incubation period is 2 to 12 days. Usually a flu-like illness occurs which resolves in 2-3 weeks. There may be fever, severe headache, pains in the back and calf and prostration. A few cases develop jaundice, when the condition is known as Weil’s disease. Although death may occur in 15% of the jaundiced patients, death without jaundice is virtually unknown. Antibiotics during the first few days help in limiting infection. Many case recover without specific treatment. If you think you may have the infection, go to your doctor and mention that thre may be a risk of Leptospirosis. The diagnosis is by clinical suspicion; blood test can rarely confirm the illness in time to affect treatment, though they may subsequently confirm it. The micro-biologist at the local hospital is the best source of advice. Each year, on average, nine watersports people contact Leptospirosis. Of these, an average of three people are canoeists. Leptospirosis is very rare and its deterioration into Weil's disease even more rare. Weil's disease is, however, a very serious illness and must be swiftly diagnosed and treated. Carefully match the paddling you're planning to do with the experience level of you and your group. Consider fitness, strength, age and expertise as well as your knowledge of the area and conditions. Make sure that you are using the right equipment for the type of canoeing you're doing. Dress appropriately and carry extra clothing with you. Always wear a buoyancy aid and wear a helmet in rough or moving water. Carry food, a hot drink and first aid equipment. The weather can be unpredictable so always be prepared for the worst. Check local, specialised forecasts and be prepared to change your plans accordingly. It doesn't take long for a river to flood in heavy rain. Plan according to the groups ability, not simply your own. Use as much information as you can gather from the CANI Access Officers, guidebooks, tourist information centres and local paddlers. Always be prepared to adapt your plans. Tell someone where you are going and when you'll be back. In the event of an emergency, call the police by dialling 999. They will contact the appropriate specialist rescue services. Always supply a map reference if possible. Treat injuries to the best of your ability.